All the latest research is showing us that getting a workout in 3-5 days per week is a great start, but isn’t nearly good enough if you spend the rest of your day sitting. I’ve heard the phrase “sitting is the new smoking” and I think it’s fairly apt. Of course, most of us have jobs that basically require extensive sitting day in and day out – but you absolutely do not have to accept that as the only way. 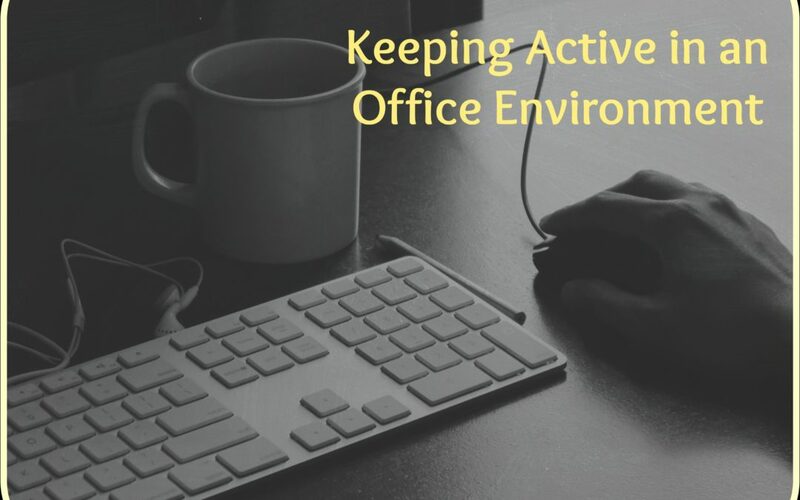 There’s plenty of ways to create an active work environment! Stand up desks are all the rage now-a-days, but they come with their own risks. Standing in one place all day isn’t much better than sitting in one place all day. Finding a desk, or something that sits upon your desk, that will let you switch from sitting to standing throughout your day would be a better choice. I like the Varidesk options, though they’re quite pricey. Treadmill desks and stationary bike desks are a thing nowadays, and while I have to assume there’s quite a learning curve, I applaud anyone willing to give it a try. Instead of moving your computer around, how about moving your chair? Try sitting on a stability ball instead of your chair for a few hours a day. It doesn’t even have to be all at once – swap back and forth during the day from chair to ball and back again. Whenever you’re on the phone, stand up. Walk around if possible, even if it’s just small laps in your office. Anytime you send an email – stand up and sit back down. Set a 30-minute alarm on your phone. Whenever it goes off, pick an activity to do for 2 minutes. Push ups off your desk, squats, heel lifts, high knee marching, tricep dips from your chair (not if it rolls), jumping jacks, lunges. Start a trend of active meetings! Instead of sitting around a conference desk, could you be standing? Walking? Set aside even just part of your lunch break to be active. Start and end your break with a brisk walk around the building or take the first 5-minutes to do a quick circuit of all the exercises listed above. Doing it outside in the fresh air and sunshine would be even better! Choose the bathroom furthest from your desk instead of closest, and try drinking one glass more of water than usual so you’ll have to get up once more per day. While I suspect that not everyone will be able to implement all these suggestions, they might get your thinking about other ways in which you could make your day filled with more movement. It’s ok to start small, too – just because you can’t commit to a 30-minute timer doesn’t mean you couldn’t maybe make a 1-hour timer work. Just because not every meeting at the conference table wouldn’t work as a standing or walking meeting doesn’t mean that perhaps you could try some meetings that way. Overall, it’s important that we start thinking about how what we do all day adds up. We know that sitting all day is bad for us. We’re starting to realize just HOW bad. THe good news is that activity adds up too, even in short bursts. Stop worrying so much about getting a workOUT into your busy day, and figure out how you can work activity INTO your day. I’d love to hear any suggestions you have for creating an active work environment. Share in the comments so we can try them all, and spread a new trend of movement while working!